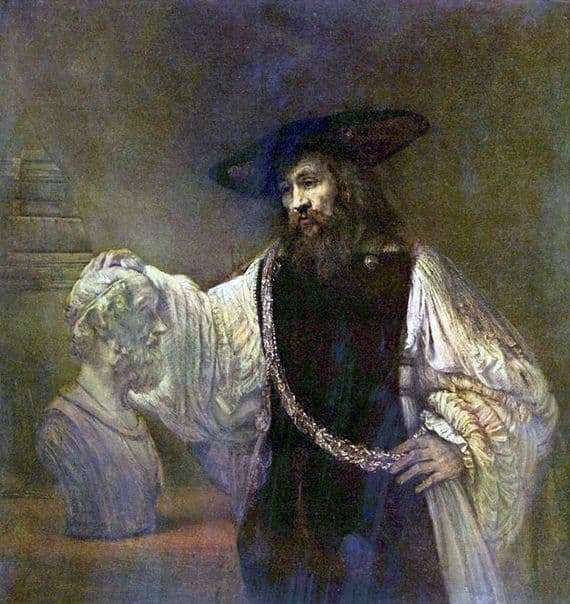 Rembrandt created a real gem of art “Aristotle in front of the bust of Homer” at the time when he was not recognized in Holland, but was revered far beyond the borders of the motherland. Antonio Ruffo, patron of Sicily, expressed a desire to replenish his own gallery of paintings with the image of an ancient Greek philosopher, and Rembrandt created the image of Aristotle to order. The sage’s robe is a shirt with wide sleeves and a dark vest, a headdress is an original hat with huge velvet floors, on the chest one can see a medallion on a silver chain. It seems that the philosopher is a contemporary of Rembrandt and just went into the studio to the artist. Cloth Rembrandt – it is a well-written portrait, which is very filigree disguised as a plot from the story. The main background of the painting is a black curtain and a huge pile of books. The central figure of the picture is Aristotle in rich attire. On the canvas, the silhouette of an ancient wise man emerges from the semi-darkness. A great philosopher in thought, he seems to be concerned with the mystery of life and leads an invisible human gaze conversation with Homer, whose bust simply shines, illuminating space and dispersing the gloom. From the painting “Aristotle…” does not blow fantastic stories, there are no colorful sketches, she is the embodiment of supernatural. Under the brush of the master some sacrament is performed. Rembrandt’s famous painting, depicting Aristotle, was part of many collections, it changed its name, but always remained expensive. This is a real gem of world art, which has always caused enthusiastic views of the audience and enjoyed incredible success in artistic circles. The greatest master of chiaroscuro Rembrandt embodied in his masterpiece of art a huge range of human feelings with a very large emotional intensity.